One week ago I had my first knitting lesson. My neighbor Jan has been so patient with me, even going back to her a couple times after messing up. So, after 1 week, I have 9 inches of a scarf. I am just doing the knitting and no purling as I was having trouble keeping them separate. 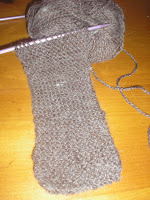 I am really enjoying it and seem to be getting into a rhythm when I am knitting. The problem is now deciding do I knit or read in my spare time????? ?